Stephen, to the series of descents in the first half of Jonah, you can also add Jonah ‘sinking’ into sleep, ירדם… and the captain saying “What’s with you ‘sinking’ נרדם ?” 🙂 Jonah has gone down as far as he can go (for now) and not only that, he ‘falls’ asleep. This is a really great post, Stephen, and I look forward to reading more on your blog! I just wanted to comment quickly, if I may, on Deb’s linguistic observation. This may indeed be a pun on the word ירד (“go down”), which appears slightly earlier within the same verse, but it’s not actually from the same root. The root of וירדם in 1:5 and נרדם in 1:6 is actually ר.ד.מ, not י.ר.ד. The noun for “deep sleep” is תרדמה (cf: Gen 2:21, 1 Sam 26:12, etc). Thanks Simon. I got the impression that there were several word plays in Jonah, although I can’t think of any off the top of my head. Do any other puns in Jonah come to your mind? The Bible is a conversation. Some books seem to be responses to other books. Even within some books it seems that one section was written in response to another, or is offered as a balance or corrective. One interesting example of this kind of inter-canonical dialog is found through the book of Jonah. Many scholars have argued that the book of Jonah represents a critique of Israelite prophecy as a whole. In many ways he best demonstrates what a false prophet looks like rather then a true prophet. Consider the following. 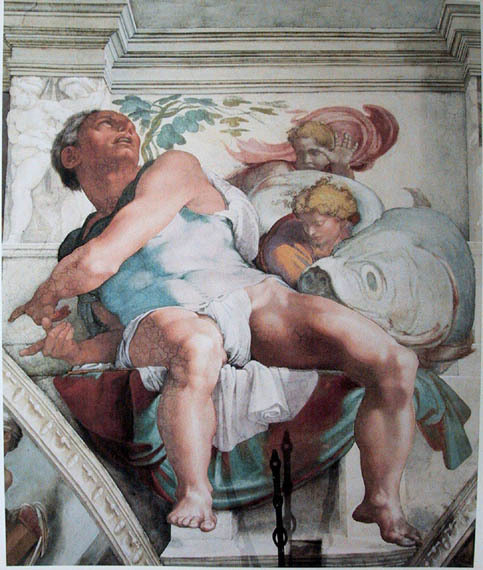 I think of Jonah as more of a comedy or satire then a serious prophetic text. Through it’s pages there is truth presented in spite of the prophet rather then through him. It’s like an ancient article from the Onion. In Jonah God is the real hero, NOT the prophet. The book of Jonah is a contrast between disobedience and obedience. Jonah was the only Old Testament prophet who refused outright to obey his God. His prayer while in the belly of the fish (Jonah 2:8) revealed his complete lack of empathy in comparison to Abram haggling with the Lord for the deliverance of any righteous souls in Sodom & Gommorah. Ironically, Jonah was willing to sacrifice himself to save the idolatrous sailors, but only so his death at their hands would be a good excuse to avoid his commission. The idolatrous sailors were more mindful of Jonah’s life than Jesus’ own people were for his. (Matt 27:25.) “Let his blood be on us and our children.” Jonah 4:10-11 also reveals the patience and lovingkindness of God with Jonah. With Jonah it was MY will be done. With Jesus it was THY will be done.